I collect barrow loads of fallen leaves for the compost heap every autumn. They take a while to rot down but it’s worth the wait because they make a brilliant mulch for my garden flower beds. How to store autumn leaves. 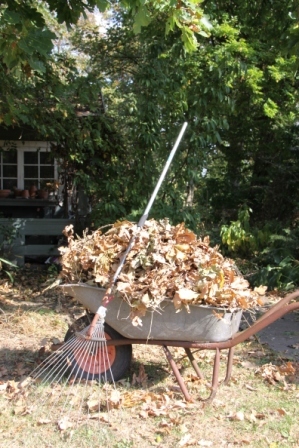 Given the right conditions your leaves will produce lovely crumbly leaf mould in just a few months. Water and air aid the rotting process. If you have a lot of leaves a large chicken wire container will stop them blowing about. Small quantities of wet leaves can also be gathered in bin bags. Puncture the bags with a garden fork to allow air in so the decaying process works properly. I try not to disturb any wild creatures whilst I’m gathering autumn leaves. 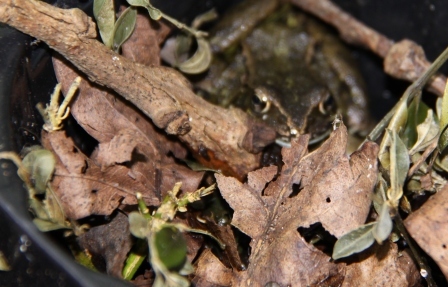 This year I uncovered a little group of frogs. They have made a home in a plastic plant tray with twigs and leaves for their bedding. I took a quick photo then covered them up again straight away. It pays not to be too tidy. Lots of wild creatures need leaves and small twigs for shelter so I’ve left plenty under the hedges for voles, mice and any other small mammals and insects that may pass through our garden this autumn. I am about to start collecting leaves here too. I agree with not being too tidy, but it would be impossible anyway as the leaves seem to keep falling or blowing around all winter. I can never believe how many I still have on my flower beds in the spring.